“All hell breaks loose” on Dorset Street as the Queen arrives to lay a wreath to Irish republicans at the Garden of Remembrance. Queen Elizabeth and President McAleese lay wreathes at the Garden of Remembrance in Parnell Square earlier today. GARDAÍ HAVE ARRESTED 21 people following separate public order incidents in the north inner city of Dublin, as Queen Elizabeth visits the area this afternoon. Separate incidents occurred just off O’Connell Street, at North Frederick Street in the city centre, and on Dorset Street. All are close to the Garden of Remembrance at Parnell Square, where the Queen laid a wreath this afternoon. One witness on the ground said “all hell was breaking loose” at Dorset Street as the Queen’s convoy reached Parnell Square to lay the wreath shortly after 3pm. A Garda spokesperson also confirmed that a public order unit had been dispatched to deal with the Dorset Street incident shortly after the Queen’s visit to Parnell Square. 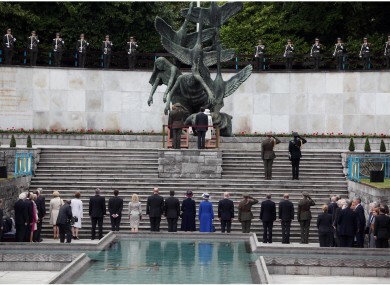 The Queen’s visit to the Garden of Remembrance saw both Her Majesty and the President of Ireland, Mary McAleese, lay wreaths in memory of those who died for the cause of Irish independence. From there, the Queen and the Duke of Edinburgh travelled to Trinity College where she met senior figures from Irish academia from a number of institutions, and a small number of selected students. Earlier, republican group Éirígí had held a sit-down demonstration at O’Connell Street to protest the Queen’s visit, opposing the visit of a monarch while the six counties of Northern Ireland remain under the control of Britain. A spokesperson for the group distanced itself from the torching of a British flag, saying such an action was not part of Éirígí’s actions. “It’s certainly not part of our protest,” Daithí Mac An Bhaird said, though he acknowledged that Éirígí were the only group to have been present there. “Given the nature of the announcement that so-called brigadiers from the UDA and some of their henchmen will be present [in Dublin this week], I certainly don’t see that the burning of a Union Jack would be the last one,” he added. Éirígí had left the area at the time of the alleged incident, Mac An Bhaird said, and moved to 16 Moore Street where it had held a demonstration in honour of “the final outpost of the GPO garrison” from the 1916 Easter Rising. It is thought that the demonstration at North Frederick Street, adjacent to the Garden of Remembrance, was largely attended by members of Republican Sinn Féin. Reports from various sources said that pepper spray had been used to clear the area. Luas services on the Red Line were prematurely suspended eastbound from the Smithfield station as a result of the incidents. Email “Twenty-one arrests in city centre as Queen visits Garden of Remembrance”. Feedback on “Twenty-one arrests in city centre as Queen visits Garden of Remembrance”.